Hi everyone! I’m Tasha from By Gum, By Golly. I’m delighted to show you a couple of items I made recently, from some yummy fabrics from Mood! Since the weather has been typically spring-like, where it jumps from cold to warm and then to snow and then sunshine and then rain every other day, I’ve had my eye on sewing things for that in-between season. When maybe short sleeves will do with long pants, or the opposite… you just never know. My pick? It didn’t take long, as they were two garments I knew I already wanted: a pair of jeans and a tee, with my own retro twist, since that’s my style. 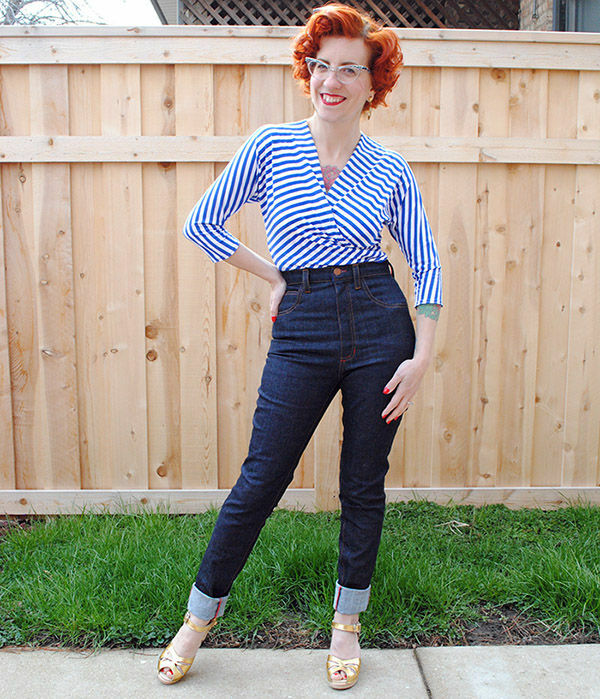 The jeans are Ginger Jeans from Closet Case Files. 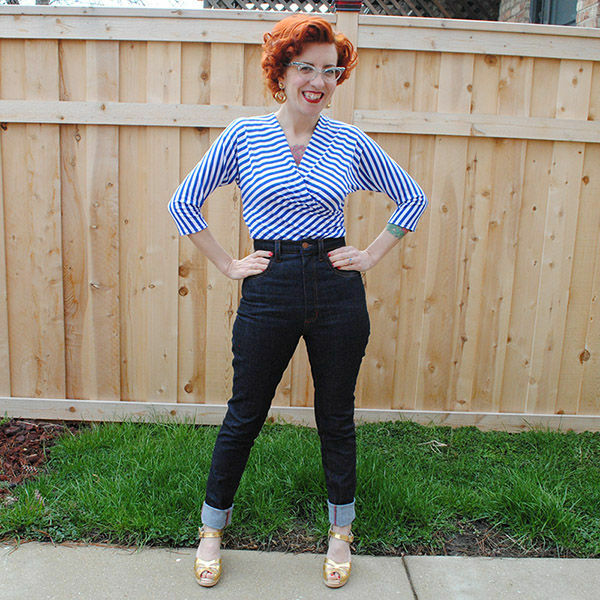 I’d sewn them once before, raising the waistline of the higher rise view 1″, and this time I raised it another 1.25″, finally getting my dream of a slim jean that falls at my natural waist for a retro look. 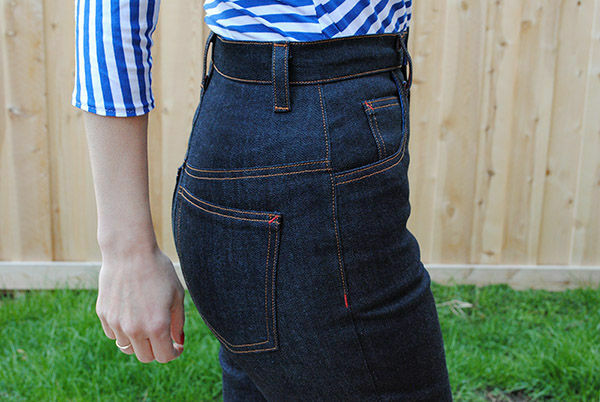 The denim is a Theory stretch indigo denim, and the fabric description of medium weight with a crisper hand doesn’t lie. This was pretty rigid when it arrived, but softened up nicely in the wash, and is a beautiful dark indigo. Let me point out here that I remember it being so difficult finding truly dark denim in RTW, but when you’re sewing, it’s plentiful. Another reason to make it yourself! I love the feel of the Theory denim, but it can be a bit stiff for skinny jeans. Fortunately, while I like the waist and torso pretty fitted, I don’t like the legs super skin tight, especially in the ankles, which I lengthened from my original pair so I could cuff them. I dutifully basted my jeans to check the fit, and admit that I probably let the thighs out more than I should have in the end. I know that denim does relax, but somehow have to convince myself of this when basting fit! But another great thing about sewing for yourself is that you learn with each project… at least in theory… so perhaps next time I’ll actually remember this! To add my own personal touch, I decided it would be fun to do red bar tacks and matching buttonhole and serger thread for my jeans, in contrast to the copper thread I used for all the topstitching. I love the look, especially the angled bar tacks in lieu of rivets! I borrowed the idea from a pair of vintage women’s jeans I spied on Etsy. 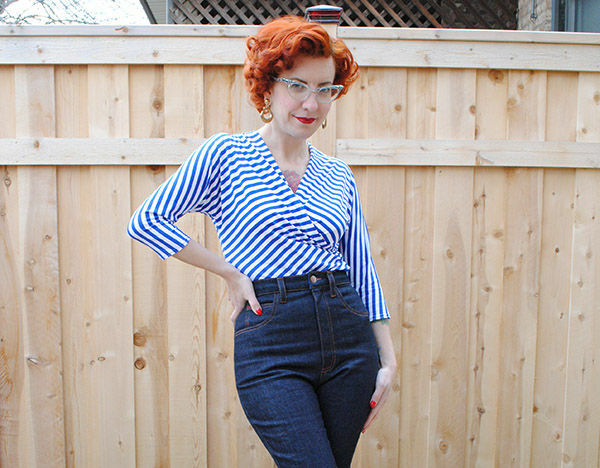 Now the top I’m wearing with my jeans is a version of Butterick B6285, which is a vintage-inspired wrap top pattern with cut-on kimono sleeves. I did a tutorial on my blog on how to turn the pattern into a surplice top that tucks in, and that’s the same thing I did for this one. 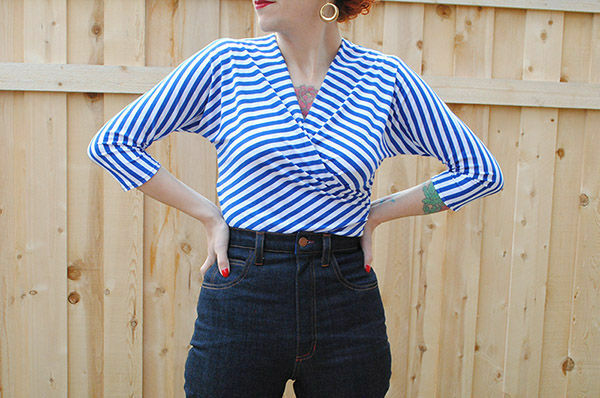 I didn’t make any changes to my pattern hack, but I carefully matched up the stripes along the center back seam. Everywhere else the stripes are left to chance, due to the shape of the pattern piece. I quite like how the stripes run down the length of the arm and bias across the body! 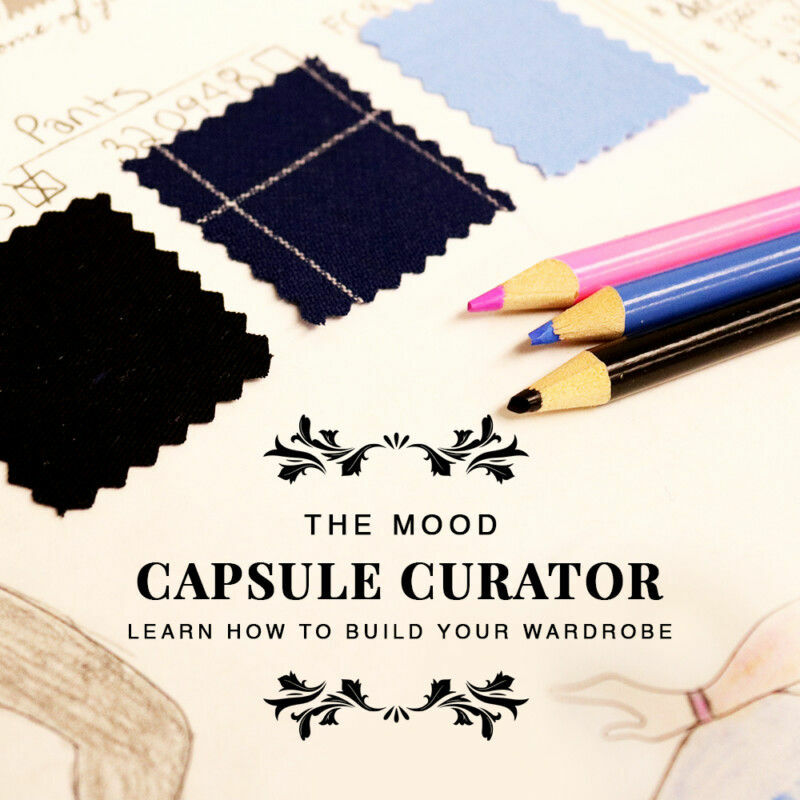 In the end I think I have a pretty fantastic outfit for spring, thanks to Mood! These were really satisfying things to make, and I know they’re both going to become staples in my wardrobe very quickly! If you’d like to see some more details of these projects and snag a chance to win a gift certificate (yay for fabric shopping! ), keep an eye on my blog soon! Great outfit, I love the stripes! Just a perfect job! Great look – and you look so happy, too!